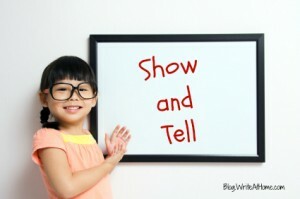 For many writing teachers and students, “show, don’t tell” has become cliche. But cliches become cliches because they are rooted in truth. The lesson below is one of the first I ever created for the WriteAtHome curriculum, but it’s just as important today as it ever was. As common as the show-don’t-tell advice has become, young writers still don’t consistently apply it. It is still the issue I address most often, especially with SAT essays. If you are a developing young writer, or if you are the parent or teacher of one, please pass on this lesson. Grasping this concept is an essential step in growing from a good writer to a great one. Don’t quite know where to post this, so I am posting it here. I just took your quiz “100 Words to Make You Sound Smart.” It seems as if you do not have the correct option listed for the word “Capricious.” None of the choices even match the definition you have linked to under the “Brush Up” option of the test! Can you comment on this please? I’ll check it out and get back to you Rue. You are correct, RP, the answer “compulsive” was mistyped. It should have been “impulsive.” Thanks for pointing out the error. It has been corrected. Wholeheartedly agree! As a writing teacher of over 30 years, I find the common theme in each classroom of “telling” too much and “showing” too little. I find that is a problem that I have. I want to get the story out so quickly that I forget that the right details can build the image so much better.